The Money Saving Custom Door: Steel Door is known to add personality to any home. 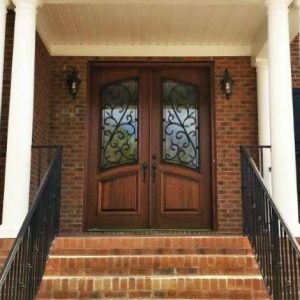 Southern Front Doors is prepared to guide you through our inventory and give details about the door or your choice. Natural Illumination. The glass that accompanies the iron door allows the sunlight into your home. As a result, you can use the sun to illuminate your home and save on your electricity bill. The Element Blocker. The steel doors are fully insulated and are equipped with Q-LON Weatherstripping which both prevents the outdoor elements from affecting your home. As a result, your air conditioner or heater is not overworked, and your electricity bill does not experience any additional hikes. You deserve to have the door you want for your home on your terms, and we are here to help as much as possible. As a result, we want to provide as many options as possible to help you bring out the beauty of your home. At Southern Front Door, our clients can browse through our large inventory to find the perfect door for their home. Contact us for your added touch of beauty to your home. For more information, contact us at 281.890.5860 or visit our website here. Set your appointment today and enjoy your door tomorrow!! !